The Cuisinart SS-5/CPT-122 is a combination of Brewing System with Toaster. The Cuisinart SS-5 is a single serve home-brewing system which is perfect for both personal use and entertaining. The brewing system makes coffee or tea under one minute. This brewer’s Push button control makes consumers easier to enjoy a for 3 beverage sizes: 6, 8, 10 oz. The system has a Charcoal water filter. The Cuisinart CPT-122 is a 2-slice compact plastic toaster with stainless steel accent which can be placed anywhere or sideways in the kitchen. It has Reheat, defrost and bagel controls and comes in a compact design. The Toaster is very easy to use and perfect for making thick bagel halves or thin sliced breads. 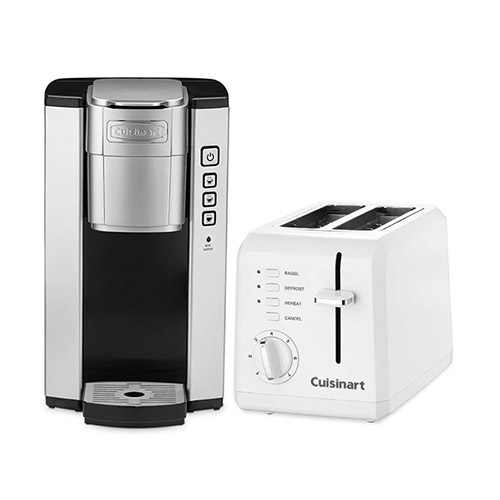 The Cuisinart Coffeemaker and 2 Slice Toaster has many exciting features for users of all types. See the Cuisinart Coffeemaker and 2 Slice Toaster gallery images above for more product views. 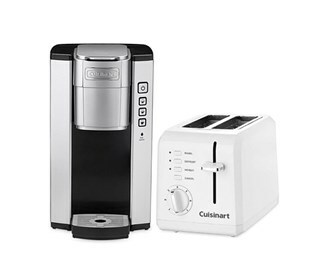 The Cuisinart Coffeemaker and 2 Slice Toaster is sold as a Brand New Unopened Item.